Belmont’s Office of Leadership Development, known across campus as BOLD, recently hosted Pulse, a day-long student leadership development retreat at the Nelson Andrews Leadership Center. With more than 125 students present, the first ever, conference-style retreat allowed students to study and apply leadership behaviors from the final component of The Student Leadership Challenge — Encourage the Heart. 18 staff and faculty members from the Division of Student Affairs, College of Liberal Arts and Social Sciences, Global Leadership Studies, University Ministries, Office of Career and Professional Development, and Multicultural Learning and Experience offered 14 interactive and engaging leadership development sessions throughout the day. Each student selected five sessions and each emphasized the importance of recognizing contributions of others by celebrating values and victories and showing appreciation for individual excellence. Students learned to accomplish this by creating a spirit of community. Between sessions, students provided live music performances, enjoyed the beautiful scenery around Percy Priest Lake and reflected on the kind of leader they are becoming. 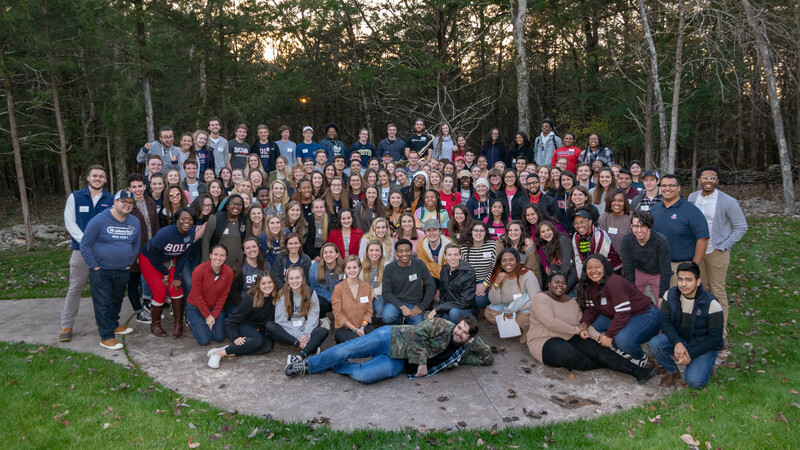 Students from every Belmont college, countless ages, diverse backgrounds, cultures, and interest came together to learn and practice leadership. Challenging sessions like “Leading with Radical Candor,” “Helping Others Ride the Bike,” “BOLD Choices: Prioritizing Values and Leading with Character,” “A Leadership Lesson from Barnabas,” “Coaching, Cueing, and Leading” and “Be You U: The BOLD Edition,” helped students learn and practice behaviors that encourage the heart. Most of the Pulse participants also completed Bruin Lead, an interactive three-evening leadership development workshop held in October and November and offered to all Belmont students. During Bruin Lead, students completed The Student Leadership Challenge by James Kouzes and Barry Posner and will continue to use their Leadership Practice Inventory to track their progress and use of various leadership behaviors of exemplary leadership throughout their time at Belmont. Facilitators from across campus guided 143 students through the challenge and helped prepare them for Pulse. 200 students are now fully engaged in BOLD programming and various campus-wide leadership development experiences as they seek to learn and practice leadership while obtaining a certificate in leadership development upon graduation. Students are able to use a co-curricular transcript in Bruin Link to track their progress and complete the four levels of leadership engagement. During Pulse, 72 students were pinned with their first Beginning-Aspiring Leader badge, signifying the completion of 40 hours of leadership development. They have moved forward to the Believing-Emergent Leader level of engagement.